Thomas Chandler, PhD, is an Associate Research Scientist at the National Center for Disaster Preparedness, The Earth Institute, Columbia University and an Adjunct Assistant Professor at Teachers College, Columbia University. He is the principal investigator of a $398,000 two year grant with the U.S. Centers for Disease Control examining the public health systems response to Hurricane Sandy in the NYC Area (2013-2015), and the principal investigator of a $150,000 two year grant with the Office of the Assistant Secretary for Preparedness and Response (ASPR), U.S. Department of Health & Human Services, on the usage of social media during disasters (2014-2016). Benita Panigrahi, MD, MS, joins NCDP as a postdoctoral research scientist, investigating the complex health systems response to disasters. Her past disaster experience includes providing general assistance and medical relief in Hurricane Sandy, Haitian Earthquake, and Hurricane Katrina response and recovery efforts. She has a clinical background in general surgery, having completed two years of postgraduate training at the State University of New York Downstate/Kings County Hospital Center in Brooklyn, NY. David Abramson, PhD, is a Clinical Associate Professor at the NYU College of Global Public Health and founding director of the Program on Population Impact, Recovery, and Resiliency (PiR2). His areas of study include disaster recovery and resiliency, the social ecology of vulnerability, risk communication targeted to high-risk or elusive communities, and survey research on preparedness attitudes and behaviors. Jeff Schlegelmilch, MPH, MBA, is the Managing Director for Strategic Planning and Operations at the National Center for Disaster Preparedness. He oversees projects related to the practice of disaster preparedness and guides the development of strategic planning for the center. His areas of expertise includes public health preparedness including planning, training and exercising. Noelle Gallant, MA, is an evaluation specialist at Yale New Haven Center for Emergency Preparedness and Disaster Response, with expertise in analyzing qualitative data regarding disaster response. The National Center for Disaster Preparedness (NCDP) has a long-standing relationship with local health departments (LHD) in and around the Metro New York Area. 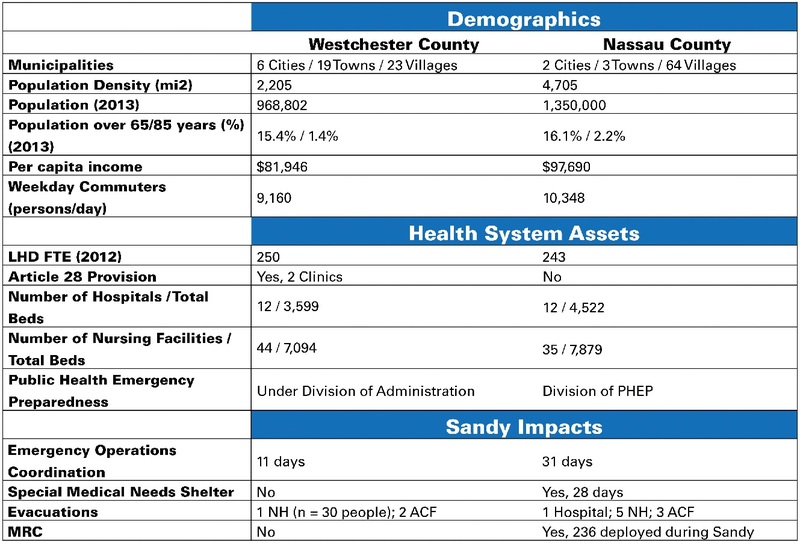 Given the shared impact of the storm, NCDP has partnered with the Nassau and Westchester County Departments of Health to carry out this study.